ESO’s GRAVITY instrument confirms black hole status of the Milky Way centre. ESO’s exquisitely sensitive GRAVITY instrument has added further evidence to the long-standing assumption that a supermassive black hole lurks in the centre of the Milky Way. New observations show clumps of gas swirling around at about 30% of the speed of light on a circular orbit just outside its event horizon — the first time material has been observed orbiting close to the point of no return, and the most detailed observations yet of material orbiting this close to a black hole. ESO’s GRAVITY instrument on the Very Large Telescope (VLT) Interferometer has been used by scientists from a consortium of European institutions, including ESO , to observe flares of infrared radiation coming from the accretion disc around Sagittarius A*, the massive object at the heart of the Milky Way. The observed flares provide long-awaited confirmation that the object in the centre of our galaxy is, as has long been assumed, a supermassive black hole. 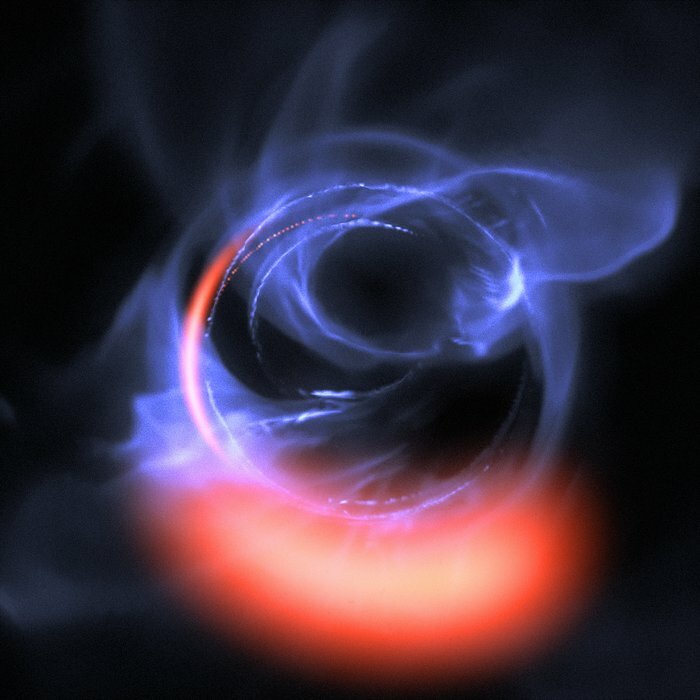 The flares originate from material orbiting very close to the black hole’s event horizon — making these the most detailed observations yet of material orbiting this close to a black hole. While some matter in the accretion disc — the belt of gas orbiting Sagittarius A* at relativistic speeds  — can orbit the black hole safely, anything that gets too close is doomed to be pulled beyond the event horizon. The closest point to a black hole that material can orbit without being irresistibly drawn inwards by the immense mass is known as the innermost stable orbit, and it is from here that the observed flares originate. These measurements were only possible thanks to international collaboration and state-of-the-art instrumentation . The GRAVITY instrument which made this work possible combines the light from four telescopes of ESO’s VLT to create a virtual super-telescope 130 metres in diameter, and has already been used to probe the nature of Sagittarius A*. Earlier this year, GRAVITY and SINFONI, another instrument on the VLT, allowed the same team to accurately measure the close fly-by of the star S2 as it passed through the extreme gravitational field near Sagittarius A*, and for the first time revealed the effects predicted by Einstein’s general relativity in such an extreme environment. During S0-2’s close fly-by, strong infrared emission was also observed. This emission, from highly energetic electrons very close to the black hole, was visible as three prominent bright flares, and exactly matches theoretical predictions for hot spots orbiting close to a black hole of four million solar masses . The flares are thought to originate from magnetic interactions in the very hot gas orbiting very close to Sagittarius A*. This research was undertaken by scientists from the Max Planck Institute for Extraterrestrial Physics (MPE), the Observatoire de Paris, the Université Grenoble Alpes, CNRS, the Max Planck Institute for Astronomy, the University of Cologne, the Portuguese CENTRA – Centro de Astroﬁsica e Gravitação and ESO. Relativistic speeds are those which are so great that the effects of Einstein’s Theory of Relativity become significant. In the case of the accretion disc around Sagittarius A*, the gas is moving at roughly 30% of the speed of light. GRAVITY was developed by a collaboration consisting of the Max Planck Institute for Extraterrestrial Physics (Germany), LESIA of Paris Observatory–PSL/CNRS/Sorbonne Université/Univ. Paris Diderot and IPAG of Université Grenoble Alpes/CNRS (France), the Max Planck Institute for Astronomy (Germany), the University of Cologne (Germany), the CENTRA–Centro de Astrofísica e Gravitação (Portugal) and ESO. The solar mass is a unit used in astronomy. It is equal to the mass of our closest star, the Sun, and has a value of 1.989 × 1030 kg. This means that Sgr A* has a mass 1.3 trillion times greater than the Earth. This research was presented in a paper entitled Detection of Orbital Motions Near the Last Stable Circular Orbit of the Massive Black Hole SgrA*, by the GRAVITY Collaboration, published in the journal Astronomy & Astrophysics on 31 October 2018. The GRAVITY Collaboration team is composed of: R. Abuter (ESO, Garching, Germany), A. Amorim (Universidade de Lisboa, Lisbon, Portugal), M. Bauböck (Max Planck Institute for Extraterrestrial Physics, Garching, Germany [MPE]), J.P. Berger (Univ. Grenoble Alpes, CNRS, IPAG, Grenoble, France [IPAG]; ESO, Garching, Germany), H. Bonnet (ESO, Garching, Germany), W. Brandner (Max Planck Institute for Astronomy, Heidelberg, Germany [MPIA]), Y. Clénet (LESIA, Observatoire de Paris, PSL Research University, CNRS, Sorbonne Universités, UPMC Univ. Paris 06, Univ. Paris Diderot, Meudon, France [LESIA])), V. Coudé du Foresto (LESIA), P. T. de Zeeuw (Sterrewacht Leiden, Leiden University, Leiden, The Netherlands; MPE), C. Deen (MPE), J. Dexter (MPE), G. Duvert (IPAG), A. Eckart (University of Cologne, Cologne, Germany; Max Planck Institute for Radio Astronomy, Bonn, Germany), F. Eisenhauer (MPE), N.M. Förster Schreiber (MPE), P. Garcia (Universidade do Porto, Porto, Portugal; Universidade de Lisboa Lisboa, Portugal), F. Gao (MPE), E. Gendron (LESIA), R. Genzel (MPE; University of California, Berkeley, California, USA), S. Gillessen (MPE), P. Guajardo (ESO, Santiago, Chile), M. Habibi (MPE), X. Haubois (ESO, Santiago, Chile), Th. Henning (MPIA), S. Hippler (MPIA), M. Horrobin (University of Cologne, Cologne, Germany), A. Huber (MPIA), A. Jimenez Rosales (MPE), L. Jocou (IPAG), P. Kervella (LESIA; MPIA), S. Lacour (LESIA), V. Lapeyrère (LESIA), B. Lazareff (IPAG), J.-B. Le Bouquin (IPAG), P. Léna (LESIA), M. Lippa (MPE), T. Ott (MPE), J. Panduro (MPIA), T. Paumard (LESIA), K. Perraut (IPAG), G. Perrin (LESIA), O. Pfuhl (MPE), P.M. Plewa (MPE), S. Rabien (MPE), G. Rodríguez-Coira (LESIA), G. Rousset (LESIA), A. Sternberg (School of Physics and Astronomy, Tel Aviv University, Tel Aviv, Israel, Center for Computational Astrophysics, Flatiron Institute, New York, USA), O. Straub (LESIA), C. Straubmeier (University of Cologne, Cologne, Germany), E. Sturm (MPE), L.J. Tacconi (MPE), F. Vincent (LESIA), S. von Fellenberg (MPE), I. Waisberg (MPE), F. Widmann (MPE), E. Wieprecht (MPE), E. Wiezorrek (MPE), J. Woillez (ESO, Garching, Germany), S. Yazici (MPE; University of Cologne, Cologne, Germany).